I had some Italian imported tomatoes left in the fridge from yesterday's cooking, and after a bit of thinking, I decided to make use of a fillet of sea bass that I froze a month ago and had to be cooked. 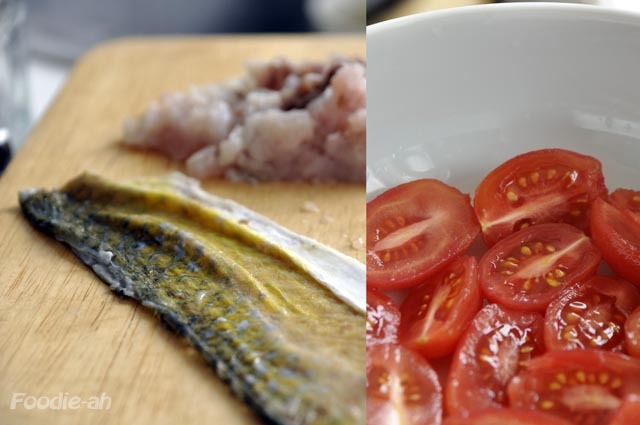 I thought the sea bass flesh would be a great way to add texture to a seafood pasta, combined with the richness of the Italian plum tomatoes. Remove the skin from the mini plum tomatoes by making an incision crosswise, boiling them for 30 seconds, and then placing them in ice water. The skin will peel off easily. Halve them lengthwise, drizzle them with some salt and set them aside. With the blade of a knife, scrape off the flesh of the sea bass until you are left with the skin. Chop the meat coarsely and set it aside. 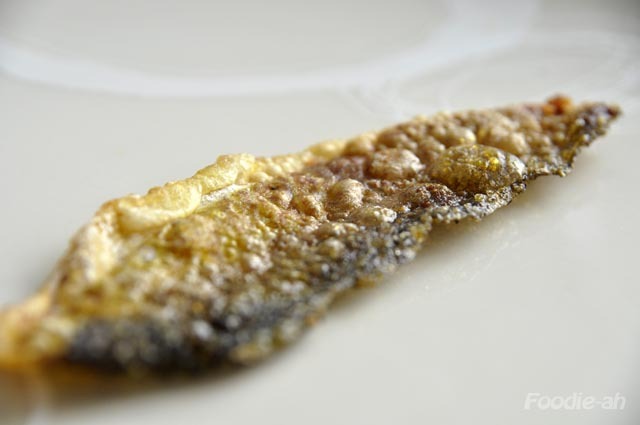 Put generous extra virgin olive oil into a large frying pan and when hot, place the fish skin carefully into it, and hold it down with a spatula to keep it straight while it fries in the oil. Turn the other side, complete the cooking and when nicely crisp and bubbly remove from the oil and pat dry with some kitchen paper. In the same oil, place the squashed cloves of garlic and the chopped onion, and fry until golden together with the stems of parsley. 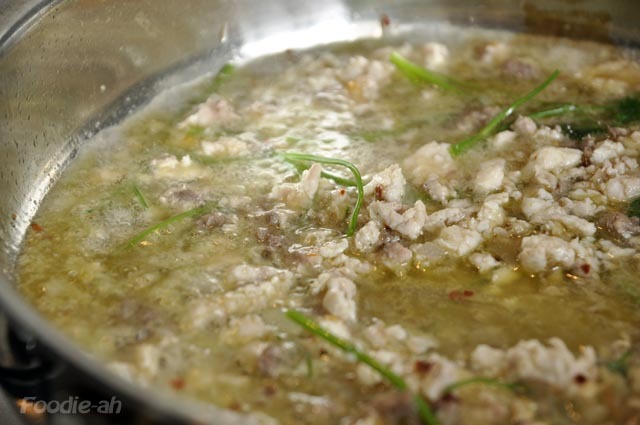 Add the chopped sea bass, fry for about 20 seconds and then pour a dash of dry white wine and let evaporate on high heat. Turn off the fire and remove the fish, garlic and parsley stems. Discard the stems and garlic and keep the fish aside. Cook the linguine into a pot of boiling water, but be prepared to remove them 3 minutes earlier than suggested on the package. 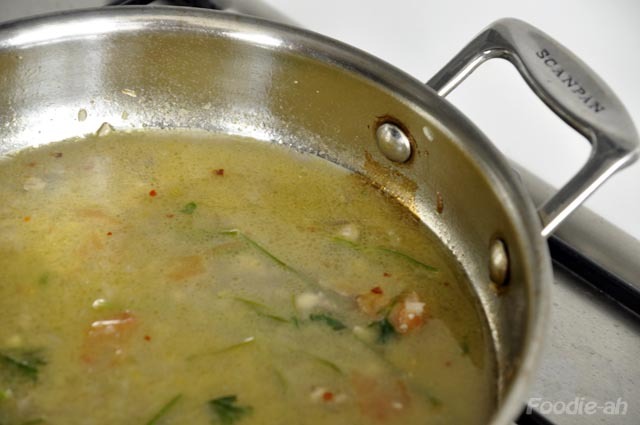 In the meantime, pour the stock and chopped parsley into the frying pan and keep over a very low simmer while the pasta is boiling. For extra flavour, I like to dissolve one of the plum tomatoes into this sauce by breaking it down inside the pan. When the linguine are ready, drain them and transfer them into the saucepan. Add 1.3 tsp of salt and stir into the pasta, while you keep it bubbling. Finish off the cooking for about a minute and a half (or until the sock is reduced by 2/3) then add the fish and the plum tomatoes and cover the pan. Let it cook for another minute or so keeping it covered, and remove from the heat. 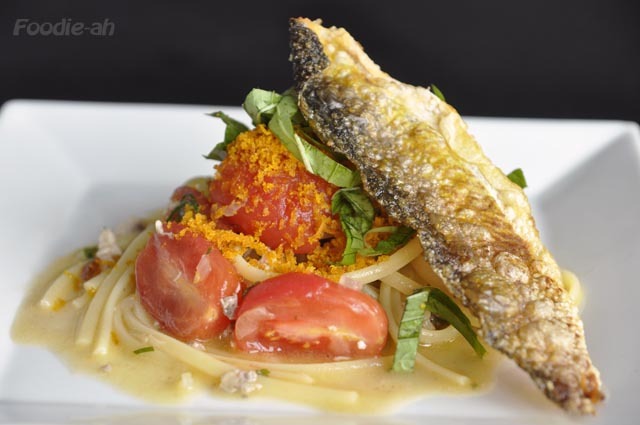 Let the pasta rest for 20 seconds, then serve on a plate pouring some of its sauce on top, then topping with the shredded fresh basil, bottarga, and half of the crispy sea bass skin.